I awoke early to a cool, gray, and drizzly morning. I looked at my calendar. I stated “Kelsey peak”. Last week I wrote this down determined I was going to do it rain or shine. Kelsey Peak is the 2nd tallest peak in the Oquirrh Mountains. I feel the Oquirrh Mountains often get overlooked. So many people live in their shadow. If you asked someone what mountains are to their west they would say Kennecott copper mine. I decided I wanted to see the tops of these mountains. Upon reaching the trailhead there were 3 trails. I wasn’t sure which way to go. According to what I had read I needed to follow the most westward trail then shortly thereafter branch off on a smaller trail that rises steadily toward the ridgeline. I missed this trail and went almost a mile down the wrong trail before deciding to turn around. Eventually I found the correct trail and ascended out of the trees to the ridge. By the time I reached the crest the rain had stopped. Gray sky greeted me and dense ground vegetation soaked my pants, socks, and shoes. After a few miles I passed Butterfield peak and got my first shocking view of Kelsey peak. I thought to myself “Whoa! 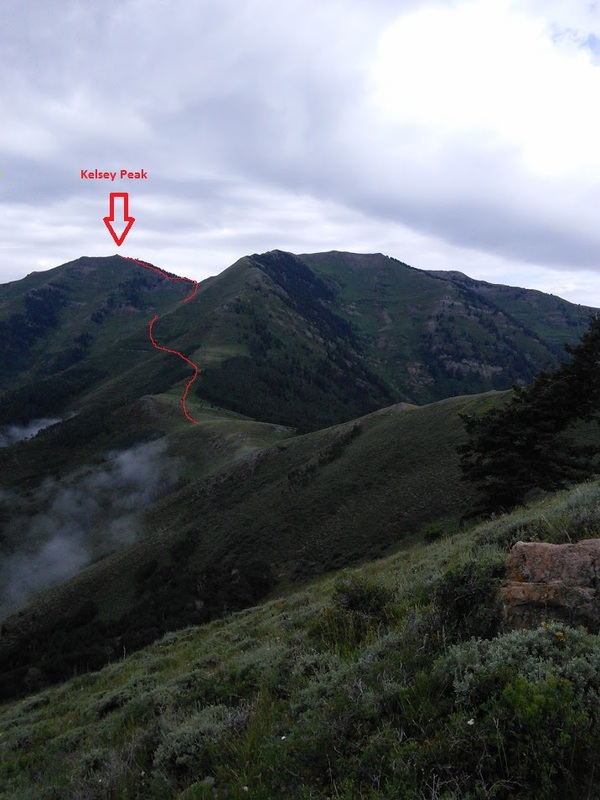 That’s high and I don’t see any evidence of a good place for a trail to ascend it.” Upon reaching the point where the trail starts going up to Kelsey peak. The trail nearly disappeared. I bushwhacked up a very steep path that might be maintained by a hand full of deer and elk every year. Several times I wanted to say this is dumb and turn around and go home. I kept thinking it will be worth it. Just do it. The other day I heard someone say “what’s hard is hard nothing more”. Life is rarely easy. When something is hard it doesn’t mean it’s not worth doing. It doesn’t mean that it will be impossible. I have learned nothing is impossible. Our bodies and minds are capable of incredible things. You are capable of doing anything. What’s hard is hard. No one said hiking up a steep mountain ridge across undefined trails in the rain was going to be easy or fun. Usually the hard things in life are the most rewarding. Once we realize that we can overcome any hard obstacle we can go and do whatever our hearts desire. So I just did it. I went straight up this trailless ridge to the peak. The going was slow and strenuous. But the top was worth it. I got to the top where a large cairn had been constructed by someone back in the 1930s. I would wager that peak gets only a few visitors every year. Not many people visit the Oquirrh Mountains recreationally. The few who do don’t venture far into their depths. I feel I got to see a view that I can cherish for a long time, as these mountains continue to get turned into a giant open pit mine.